Cement augmentation using PMMA cement is known as an efficient treatment for osteoporotic vertebral compression fractures with a rapid release of pain in most patients and prevention of an ongoing kyphotic deformity of the vertebrae treated. However, after a vertebroplasty there is no chance to restore vertebral height. 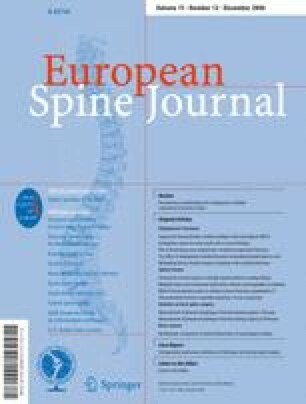 Using the technique of kyphoplasty a certain restoration of vertebral body height can be achieved. But there is a limitation of recovery due to loss of correction when deflating the kyphoplastic ballon and before injecting the cement. In addition, the instruments used are quite expensive. Lordoplasty is another technique to restore kyphosis by indirect fracture reduction as it is used with an internal fixateur. The fractured and the adjacent vertebrae are instrumented with bone cannulas bipediculary and the adjacent vertebrae are augmentated with cement. After curing of the cement the fractured vertebra is reduced by applying a lordotic moment via the cannulas. While maintaining the pretension the fractured vertebra is reinforced. We performed a prospective trial of 26 patients with a lordoplastic procedure. There was a pain relief of about 87% and a significant decrease in VAS value from 7.3 to 1.9. Due to lordoplasty there was a significant and permanent correction in vertebral and segmental kyphotic angle about 15.2° and 10.0°, respectively and also a significant restoration in anterior and mid vertebral height. Lordoplasty is a minimal invasive technique to restore vertebral body height. An immediate relief of pain is achieved in most patients. The procedure is safe and cost effective.